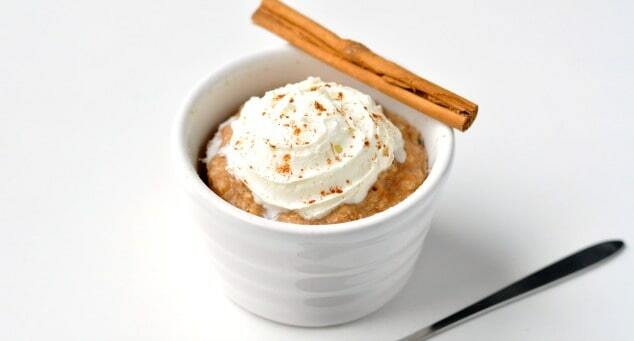 Healthy Cinnamon Roll Mug Cake Recipe | A Single-Serving Treat Ready in 2 Minutes! Love ooey-gooey cinnamon rolls but don’t want to indulge in that much fat and sugar first thing in the morning? Then this healthy mug cake recipe is the one for you! 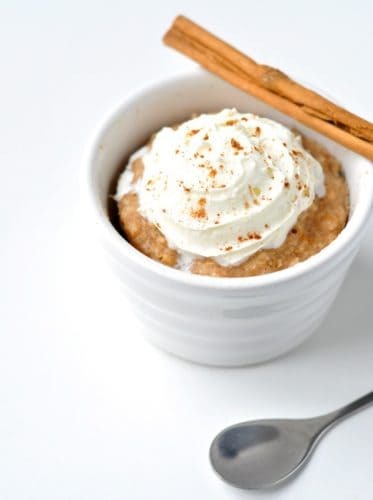 Made with nutritious, wholesome ingredients, this healthy cinnamon roll mug cake has all the delicious, decadent flavours of a cinnamon roll with only a fraction of the calories. Sounds too good to be true? Trust me – it’s not! This recipe was inspired by one of the most popular breakfast recipes on Happy Healthy Motivated: Healthy Deep-Dish Breakfast Chocolate Chip Cookie. 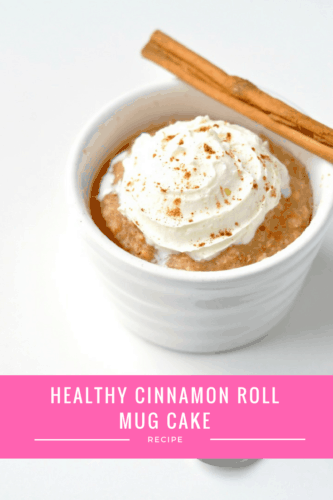 Since you really love that one, I figured basing this healthy cinnamon roll mug cake recipe on it would result in a winner – and it totally did! Now I’m not going to say that this healthy cinnamon roll mug cake has the exact same texture of a cinnamon roll. Because it simply doesn’t. The texture is light and fluffy like a cake, while also being chewy and satisfying, thanks to the heart-healthy oats. This makes it suitable for a sweet snack or delicious breakfast. Yep, that’s right. You can totally eat this healthy cinnamon roll mug cake for breakfast and not feel bad about it at all! Have you noticed how difficult it is to find genuinely healthy mug cake recipes? Loads of them include at least 1 tablespoon or oil or butter. That might not sound like a lot, but when you compare it to the amount of oil or butter you’d consume eating an ordinary (i.e. not “healthy”) slice of cake, there’s usually more in the healthy single-serving version than a portion of the full-fat version. Not what you expect from a healthy recipe, right? That’s why I always try and replace oil or butter with natural or Greek yogurt. I did it in this Healthy Chocolate Fudge Mug Brownie and I’ve done it again in this healthy cinnamon roll mug cake recipe! Cooking time will vary between microwaves and according to how deep the mug you’re using is. 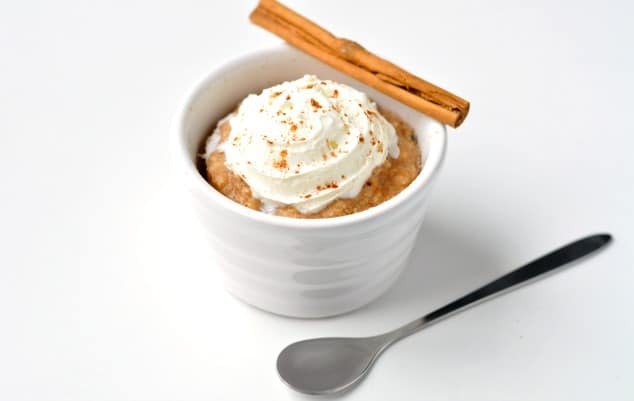 My healthy cinnamon roll mug cake takes 80-90 seconds to cook. I recommend you try cooking your mug cake for 60 seconds and if the top is still wet and doughy, put it back in the microwave for an extra ten seconds. Keep going in bursts of 10 seconds until it’s fully cooked. If it wasn’t for oatmeal and microwave mug cakes, I’d never use my microwave at all! How do you feel about mug cakes – love them, hate them or just don’t care? Stir together all the dry ingredients for the cake (oats, flour, stevia powder, baking powder and ground cinnamon) in a large mug or ramekin with a fork. Add the yogurt and stir thoroughly to make sure there are no dry pockets hiding anywhere. Place the mug or ramekin in the microwave and cook on full power for 80-90 seconds, until the cake has puffed up and it's no longer wet on top. Remove the cake from the microwave and top with the yogurt and a sprinkling of ground cinnamon before eating hot. This looks so good! 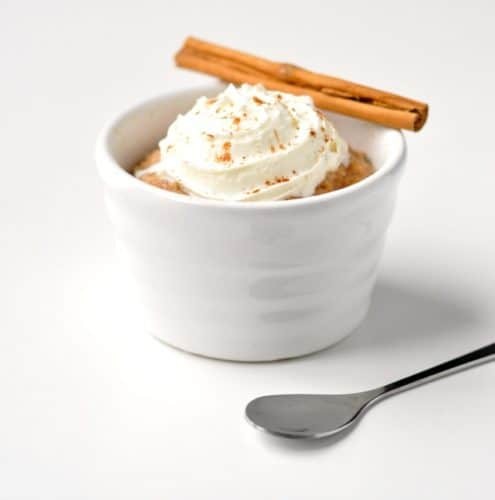 I’ve been craving cinnamon desserts all week and this really fits the bill. This is such a great idea. Sometimes I have the craving for a little bite of something sweet but nothing too big and mug cakes and this delicious looking cinnamon roll are genius and just the thing I need! Thank you for sharing! PINNED! I just found your site (from the Friday Favourites party), and I haven’t left! I love all of your recipes!! Thanks so much for stopping by, Krissy. I’m thrilled you love my recipes! Looks delicious, I love cinnamon rolls. Thanks for linking up to Sweet and Savoury Sunday, stop by and link up again. Have a great day!! What a great little treat. Thanks so much for sharing with Full Plate Thursday and have a great week. What a great idea! My little guy and I will have to try these for breakfast tomorrow. He loves to help and this would be something easy to make together! Stopping in from Made by you Monday – What an easy way to satisfy a craving. Cinnamon roll has always been a pregnancy craving of mine and I wish I had known how to make this then. I will have to try it once the kids are in bed so I don’t have to share! Cinnamon rolls are the best. I never make them though because of the rise time. This is the perfect solution. Pinned! Hope you enjoy it as much as I do, Tai! YUM! This looks great – I love the addition of oats to add that chewyness and healthy fibre factor. oh, yum! Now I now what to do with all of the leftover oats I still have – perfect! A cinnamon oaty breakfast sounds good to me. Looks rather tempting. Nice to see a reduction in fats and still be yummy. This is awesome for breakfast…I think I will have to try it out this weekend. You know, it would even be great as a dessert too. Perfect anytime you want a “fresh made” treat. Exactly, Gloria! No matter how tight time is, there’s always time for a microwave treat. Very well done! Your recipe is perfect for satisfying the “goodie” craving with healthy ingredients. One serving is perfect, too. So easy to make it all in a mug and great that it’s healthy too! How pretty this is! I love this flavor combo- what a great way to start the day! Thanks so much, Jessy! You can’t beat the oat and cinnamon combo!